July 18, 2017 – Munich, Germany: Tetras announced today its official ranking as one of the largest language services providers (LSPs) in the global translation, localization, and interpreting industry. 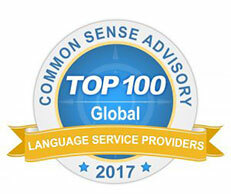 Issued July 2017 by independent market research firm Common Sense Advisory (CSA Research), the report titled “The Language Services Market: 2017” ranked Tetras as a top-grossing LSP in the US$43.08 billion global market for outsourced language services and technology. Tetras was named as the 83rd largest LSP in the world and the 20th largest in the region of Western Europe. As part of the study, the firm surveyed providers from every continent to collect actual reported revenue for 2015, 2016, and expected revenue for 2017. CSA Research, which has published market size estimates and global rankings for the past 13 years, found that the demand for language services and supporting technologies continues and grows at an annual rate of 6.97%, representing an increase over the last year’s rate of 5.52%. Tetras Translations is an international company with 20 years of experience in the area of technical translation. Company takes over all professional technical interpretation requests, all translations, localization, DTP services and services in the area of technical documentation. “The sheer number of countries, people, and languages – many of them in markets experiencing tremendous economic growth – assures that demand for language services will only increase over time. As our research conclusively demonstrates, people are much more likely to purchase products in their own language. In addition, localization reduces customer care costs and increases brand loyalty,” explained Don DePalma, CSA Research’s founder and Chief Strategy Officer. As an international company with headquarters in Munich and other branch offices in the USA, Slovakia, the Czech Republic and Poland, you can find Tetras clients in all continents of the world. Tetras works with translators, revisers, professionals, specialists and scientists from more than 40 countries, who are always native speakers of the desired target language. With 1,143 professionals in 5 branch offices worldwide and 235 language combinations for more than 2,700 clients, Tetras belongs to the TOP 100 translation companies in the world since 2012.